Watching this film seemed inevitable to me, it’s practically on every “Top films of all time” list on Letterboxd and IMBD. It has a 100% certified fresh rating on Rotten Tomatoes and practically every single movie critic deems it worthy of a 5-star rating (some might say it deserves even more credit). Since it’s considered the best court drama of all time as well as a “timeless classic”, I kept it on my watch-list for almost a year now. However, whenever I’d decide I’d watch it, some other film would come my way and distract me. Yesterday was the day I finally cracked. The poster for Sidney Lumet’s 12 Angry Men (1957). So I went and watched the 96 minutes film and I was shook. 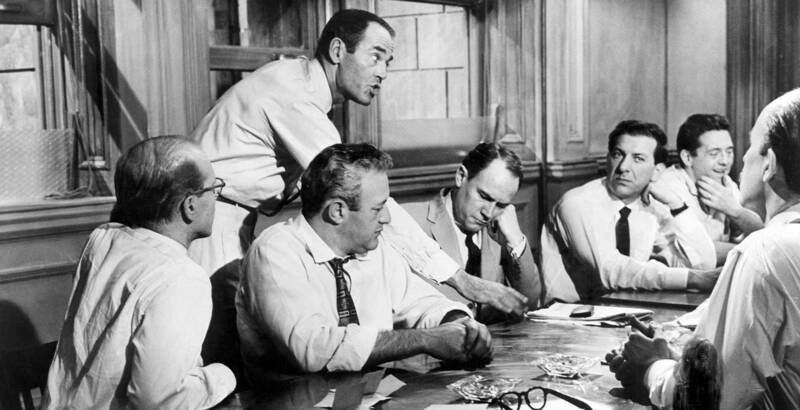 The film in its entirety takes place in a single room in New York City, where 12 (white, but not all angry) men argue over the innocence or guilt of a young man. It’s the hottest day in the year and these 12 men, all with different and diverse personalities, backgrounds, occupations and prejudices, gathered to decide whether they’ll sentence this 18-year-old Spanish-American boy to death. You never know whether the boy was in fact guilty or not, whether he killed his own father or not. You do, however, watch these twelve men debate the probability that he might not have done it. Juror 8, played by Henry Fonda, is himself unsure of what really happened, but he doesn’t want to lead someone who might be innocent straight to an electric chair. He puts himself in the boy’s shoes and perhaps defends him better than his own lawyer. He sways the 11 jurors towards the possibility that the evidence may not be the absolute truth and that the facts presented aren’t necessarily so. We, like the rest of the jury, begin to question everything as time passes. We start to lean towards the idea that the accused might actually be innocent, and throughout this process we discover more about each character as well as ourselves. Perhaps, as an audience or as onlookers, it’s easier for us to be swayed and predict that jurors will be swayed as well and eventually vote for acquittal. Yet if you put yourself in their shoes, like Juror 8 did with the boy, you’ll realize how difficult the choices you have are. Looking closely, there are four possible scenarios that a situation like that could go. 1. The boy is guilty and the jury votes guilty. In this case, the jurors have made the right decision and have served justice to a boy who murdered his own father in a rage, having had enough of his abuse which he had suffered through since he was 5. The motive is clear, the evidence points to him and eyewitnesses support the prosecution’s case. It’s a basically, as described in the beginning of the film, an open and shut case. 2. The boy is innocent and the jury votes guilty. Here the jury makes a grave mistake, one that literally sends a boy to his grave. A boy who had done nothing to deserve such a fate would to be electrocuted to death. A boy who had lived his whole life in poverty and saw nothing but dirty slums and his father’s abuse after his mother passed when he was 9, who’s barely seen the world, heck, a boy who never really lived. Keep in mind, the idea of executing a young man for a crime he might not have committed is what drives our plot, drives Juror 8 to hesitate in the first place. 3. The boy is guilty and the jury votes not guilty. If this scenario takes place, that means a murderer would walk free. Someone who killed his own father, how’d you feel about someone like that roaming free? As pointed out by juror 7 (portrayed by Jack Warden), the defendant had a history of crime from as early as 10 years old. He’s a thief, a knife player (yes, it’s a thing) and a murderer; he’s not exactly the ideal citizen. Although, like Juror 8, you could argue that he never even stood a chance, not really with his father looming over him and his circumstances crippling him from the beginning. 4. The boy is innocent and the jury votes not guilty. This is probably the scenario that many of thviewers hoped for as the plot progressed. It seems like the best outcome for everything. Like I mentioned before, the notion of punishing an innocent man was what created the initial conflict in the movie. So if the boy isn’t to blame for his father’s death and he walks away free, it’s all good, right? Except who did kill the father? Who is the true murderer? This film isn’t the most impressive in every aspect, it doesn’t dazzle you with bright colours. But it does keep you on edge with director Sidney Lumet’s work that makes you feel as claustrophobic as the jurors must’ve felt with the rising tension. The fantastic script and witty dialogue written by Reginald Rose is the heart and soul of the film; I’ve never seen a film that, depending solely on plot line, personality conflict and conversation, manages to reach this level of perfection. The cast, lead by Fonda, is more than stellar and each actor succeeds in embodying the traits that ultimately define their character. For me, Lee J. Cobb aka Juror 3 was the most memorable of the 12 jurors and the most quotable too! You see, only two of the scenarios I mentioned earlier are faultless while the other two are disastrous. The thing is, though, none of the jurors could be entirely sure of anything. Even it they rightly free/sentence the young man, they’d never really know that what they chose was the correct choice. That’s what really got me into the movie, we never really know. Is the boy innocent or is he guilty? If he didn’t kill his father, then who did? And why would they frame a kid? Or is the boy guilty? Was he finally fed up with his dad’s abusive nature? Was it impulse? Why did he return to the crime scene if he did do it? This film takes what seems like solid evidence and unquestionable testimonies turns it into doubts and a matter of circumstance. Similar to the jury, we begin to fear the lingering threat of injustice. The fact that we’re not sure makes it harder for everyone to convict someone who might as well be a victim. That’s probably what I really loved about the plot, never knowing the answer, because the film isn’t about solving the crime but rather whether the jury finds any reasonable doubt about the boy’s guilt. It’s also about how the juror’s prejudices, preconceptions and personal life could greatly affect their findings, their verdict and the life of another. 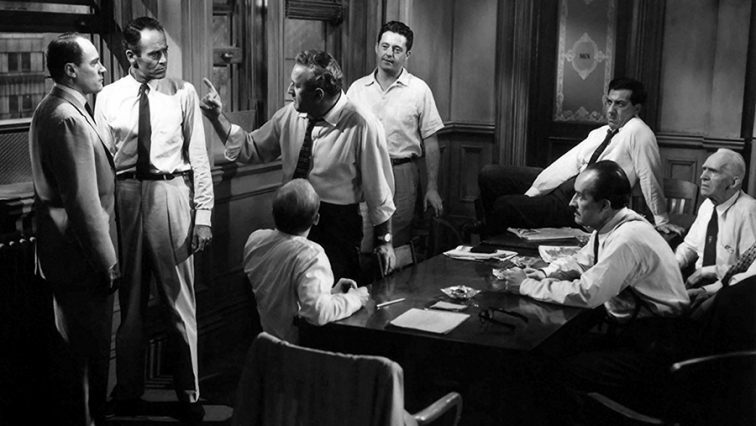 Have you seen 12 Angry Men? If you did, what are your thoughts on it? Do you think the boy really killed his father? Please share with us in the comments!